Giveaway has ended. Click HERE to see the winner. I have the BEST EVER Giveaway for you guys today. It is sponsored by Independent Watkins Consultant - Melissa #403264. She is offering one of Eat Cake For Dinner's readers an 11 oz. bottle of Watkins Double Strength Vanilla. That is a BIG bottle of vanilla and you will use every last drop of it. 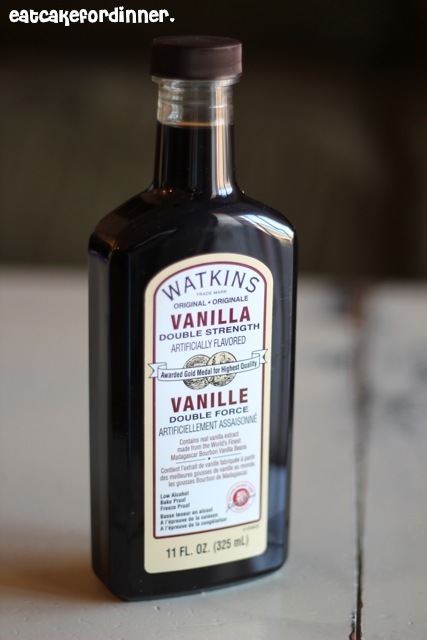 Watkins Vanilla is the BEST vanilla I have ever used in my entire life and I have tried A LOT of vanilla. Check out my vanilla stash. There really is a difference in good vanilla. I promise, it is worth every single dollar spent. Ounce for ounce this stuff is a great deal. I know what you are thinking . . . WOW, this girl is really passionate about her Vanilla. The truth is, I really am. I tried for years to figure out how to make the perfect frosting. Now, I get asked all of the time, why does your frosting taste so good? Mine never tastes like that. Well, my friends, I am letting you all in on my SECRET INGREDIENT . 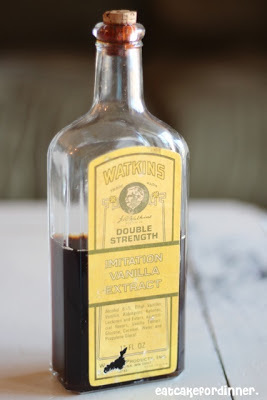 . . WATKINS Double Strength Vanilla. This vanilla is made with Madagascar Bourbon vanilla beans and is low in alcohol, so it is all Vanilla flavor. It makes the best frosting, homemade whipped cream, ice cream, divinity, cookies and everything else you can think of. The first time I tried homemade whipped cream with Watkins Vanilla, it was game over. BEST THING EVER. It also makes the best present for Birthdays, Christmas, Mother's Day, Father's Day, Wedding, House-Warming and so on. Even my Grandma used to use Watkins Vanilla. Check out this vintage bottle I found in her fruit room. A glass bottle with a cork top - I love it. It still smells like yummy vanilla too. etc . . . My friend just got the Lemon Cream Lotion and it smells so good. 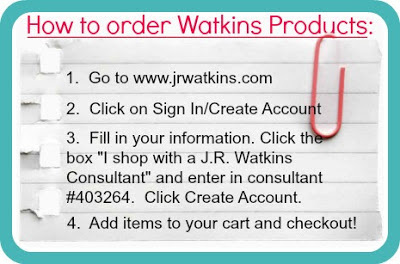 Please go order some Watkins products through Melissa. I know you will be so pleased and will become a lifetime purchaser of these products. 1. Mandatory Entry: You must be a follower of Eat Cake For Dinner via Facebook, Pinterest, e-mail, Google+ OR Bloglovin'. Leave me a comment and let me know which way you follow. 2. Optional: Leave me a separate comment and let me know your favorite recipe that calls for vanilla extract. 3. Optional: Follow Melissa's "Baking and Home Products" Pinterest board and leave me a comment letting me know you did. Giveaway will end on Tuesday, June 25th and I will announce the winner on Wednesday, June 26th. Winner must respond within 72 hours or a new winner will be selected. Giveaway is sponsored by Independent Watkins Consultant, Melissa #403264, but all opinions expressed herein are my own. Ga! I love this stuff. My Watkins dealer was at my other job we all ordered from her. I dont see her anymore so this is great to find a dealer online! I do not necessarily have a favorite recipe that uses vanilla. However, I generally add vanilla to any baking recipe that I make. I just love that extra little taste it provides! Hi, thanks for visiting my blog. I love the name of your blog since I could easily eat cake for dinner...every night! :) I just signed up for your emails. I love vanilla in so many things, it just adds something special to everything. Thanks for offering the giveaway! I love using vanilla in classic chocolate chip cookies! I follow on facebook and GFC. I just won the cookbook, but I love, Love, LOVE vanilla, too. I love vanilla in everything and often add it even when uncalled for. My fav though is spritz cookies. My favorite recipe that uses vanilla is good old-fashioned white cake with chocolate frosting! I followed you on Eat Cake for Dinner! I am a follower on facebook and pinterest. My email is patty4260@comcast.net . Thanks! My favorite recipe that calls for vanilla would have to be homemade sugar cookies & frosting! My favorite recipe would be my famous chocolate chip cookies. I'd love to try the recipe with this vanilla! My favorite vanilla recipe is a vanilla cream pudding recipe that I got from my mom-- excellent in fresh fruit tarts! I LOVE VANILLA!!! I also follow you on facebook and bloglovin! My favorite recipe with vanilla... so hard... vanilla makes everything better. When I try a new recipe I always look for the one that has the most vanilla. My favorite is probably pretty lame but I love the taste of vanilla in chocolate chip cookies. I Love Vanilla in my cookies, I follow you on facebook bloglovin and pinterest!! One of my many favorites to make & eat with vanilla is creme brulee. i love vanilla and use it in everything so dont really have a "fave". i guess i could say my go to sweets recipe, a delish brownie recipe from my trusty better homes and gardens cookbook is the bestest when i use salted butter and extra vanilla. i just bought vanilla pods to make my own - need to find "recipe" - think you ^put pods in vodka? I love your blog and follow on Bloglovin! Great giveaway! I have a fantastic cream cheese pound cake recipe that needs some Watkins vanilla! Hope I win! I'm following Melissa's Pinterest board! I'm a Facebook follower, and I use vanilla in pretty much everything that I bake. It's hard to choose a favorite! I love Watkins flavorings. I buy them at Walmart and the prices are so much better than the others. I follow by email--love vanilla!! My favorite use for vanilla is in cookies and cakes. If Watkins' vanilla is anything like Watkins' almond, I'm a fan. I follow the blog! I tell you, you give out the BEST information! I have made quite a few recipes you have posted and they are all wonderful. I have had people say Mexican Vanilla will make all the difference, and it really didn't, I'm so excited about this Vanilla, it sounds amazing. I use Vanilla a lot, in muffins, breads, frostings, and I have always had a bad reputation as a cook. Since being a stay at home mom I have to say I"m now pretty good, I can still mess stuff up but I'm really coming around. I would love to wow some of the family! My absolute FAVORITE recipe that calls for vanilla extract, is frozen peanut butter chocolate pie - a recipe our family made up! I'm a facebook and pinterest follower. I do love good vanilla. Whipped cream is not complete without vanilla! I'm a follower through e-mail! I make my own vanilla but would love to compare it to Watkins. WHAT IS A GOOD CHOCOLATE CHIP COOKIE WITHOUT GOOD VANILLA?? LOVE your site and follow you by email and facebook. Can't say that I can pinpoint one recipe, but I love a good baked cheesecake. Cookies are my favorite to use a high quality vanilla extract. My favorite recipes to use vanilla in are pumpkin chocolate chip cookies, vanilla steel cut oats, and pumpkin chocolate chip bread. 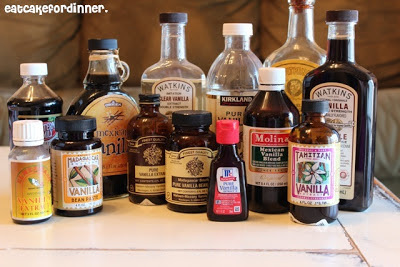 I love vanilla extract, well all extracts for that matter! I'm definitely going to try Watkins. I follow you on email and try many of your recipes and have yet to find one my family doesn't absolutely love! Awesome giveaway! Vanilla is a staple I use it in everything! I am a follower via FB, pinterest and google+. I love using vanilla in pancakes and french toast! I now follow Melissa's Pinterest board, too. My favorite recipe that uses vanilla is probably sugar cookies. I follow the Baking and Home Products board on Pinterest. I use it in Italian Whipped Cheesecake. I follow via emails. Thank you! I love vanilla in any quick bread I make, mostly pumpkin!! I followed Melissa's board on Pinterest, looks cool!! I follow through e-mail, my boys laugh at the title for your blog. As a fellow vanilla sniffer, I will have to order some. Our next recipe with vanilla will be homemade ice cream. I'm a brand new follower and follow you through Pinterest. I am looking forward to trying Watkins in smoothies and baked goods. Chocolate chip cookies, angle food cake and frostings are a few of the things we use vanilla in!! I follow you on Facebook and Pinterest and follow Melissa on Pinterest. I love your blog. My favorite thing with vanilla in it is SNOW CREAM! I just love that stuff. For those of you that doesn't get any snow, if you don't know what snow cream is....basically it is snow ice cream. The vanilla flavor really comes through in the snow cream. That's an impressive vanilla collection! My favorite thing to make using really good vanilla is ice cream. Thanks! I follow Baking and Home Products board on Pinterest. I like my Italian cheesecake recipe. Thank you!! I enjoy follow via email. Thank you! Yum! What a great giveaway! A good vanilla really does make all the difference. I follow your blog Google+. I love the chocolate chip cookie recipe I got from the coffee house I used to work at. Yum! I follow your blog on Facebook, and also with Feedly. My favorite recipe using vanilla... ummmm.. I dunno. Any type of cookies!!! And I am now following Melissa's baking pinterest board! I am a follower of Eat Cake For Dinner via Facebook (as Margot Core), on Pinterest (as Margot Core), e-mail to this box: margueritecore [at] gmail [dot] com, Google+ (as Marguerite Core) AND Bloglovin' (as Margot Core). I love to make a classic Yellow cake with vanilla extract to flavor it and the icing too. I follow your "Baking and Home Products" Pinterest board (as Margot Core). My favorite way to use good vanilla and vanilla bean is Vanilla Bean Ice Cream. yum! I followed Melissa's Pinterest board. I add vanilla to most of my cake/cookies/sweet bread recipes, even when it doesn't call for it in the recipe. I follow you via email. Love everything vanilla, especially buttercream frosting for a white vanilla cake. I love using good vanilla in vanilla cupcakes. My favorite thing to make with vanilla is just about anything. My kids love it when I add it to pancake batter! I follow you on pinterest. I would love to win. My step mom only used Watkins when she baked.